Sunday Photo; JiJang Bosal gazing at Mudeung Mountain – Wake Up and Laugh! I’ve always really liked JiJang Bosal. His green hair, his staff, his Great Vow. This is a beautiful bronze JiJang Bosal, outside of a small temple at the foot of Mudeungsan. He is my favorite Bodhisattva. Thank you for your lovely pictures. Thank you Joseph — I look forward to your photos every week. 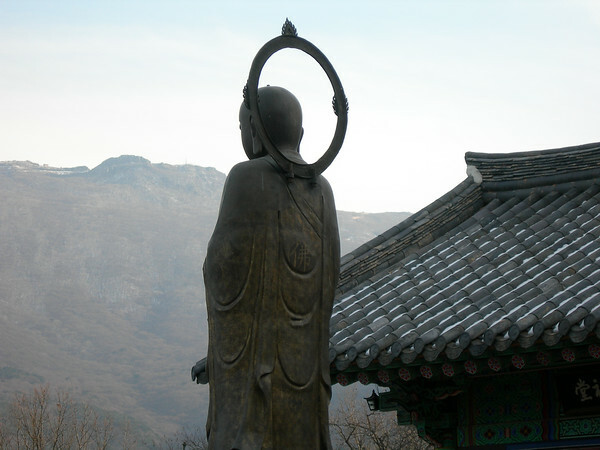 Is JiJang Bosal what in Japanes Zen is called Jizo? They’re the same person; in Sanskrit the name is Ksitigarbaha.